Brief Synopsis – A man is sent to prison for murder and in order to pass the time starts collecting birds which over the years helps him become an expert in the subject while still in prison. My Take on it – This is an enjoyable film despite the fact that it supposedly is very far from the truth. 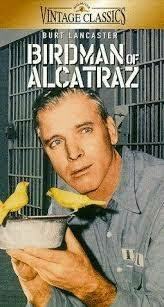 Burt Lancaster was a great actor and this became one of his most famous roles because he was able to show how his bitter character could be reformed by the penal system to a point where he could care for birds and be compassionate to his fellow inmates. He desrevingly was nominated for a Best Actor Oscar for this role, but in a tough year, he was far from being the best of those nominated. Karl Malden does a nice job playing the warden of the prison and his rovalry with Lancaster’s character feels a bit too contrived throughout. Yes, it makes for good drama, but the fact that warden’s are usually depicted as being corrupt and mean and the prisoners compassionate doesn’t work as well in this kind of story. Despite all of this movies factual flaws, they do a nice job of trying to show how a character serving his life in prison can try and find a way to stay calm and pass the time while there without causing too much trouble. The character arc of Lancaster’s character works within the context of the story, but not necessarily through the context of historical truth. Bottom Line – Lancaster is great in the lead role and deservingly was nominated for an Oscar for this role. Unfortunately, the narrative doesn’t work so well and something feels missing from the way this story is told. The bitter rivalry between inmate and warden feels a bit too convenient and tries too hard to show the warden in a bad light which seems to have been done solely for dramatic effects. Despite the fact that this film is apparently far from the way things really happened, it does a nice job of showing how an inmate can try and become more serene while going through the penal system. Lancaster’s character’s arc works quite well within the confines of the story being told but not necessarily through the context of historical truth. Recommended!